Integrating the Environment in Urban Planning and Management:: Key Principles and Approaches for Cities in the 21st CenturyThe report states that with over half of the global population now living in urban areas, cities are increasingly facing the challenge of ensuring decent standards of living for their inhabitants. Demand for a higher quality of life is increasing despite growing pressures on natural resources and ecosystems. Urban areas occupy just 2.8 per cent of the world's land area but consume up to 75 per cent of its natural resources. In addition, estimates indicate that cities are responsible for 75 per cent of global CO2 emissions, with transport and buildings being among the largest contributors. In looking at the rapid pace of urbanization and assessing the desired transformations, the report finds that these situations provide an opportunity to build more sustainable, innovative and equitable towns and cities, and to use the world's natural resources more efficiently. 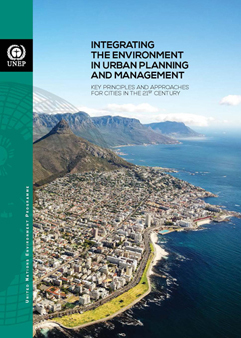 The report recommends using a range of principles and approaches to integrate the environment in urban planning and management and offers strategies for decision-makers to introduce measures that can spur inclusive economic growth and reduce poverty, while ensuring sustainable levels of consumption and production. It starts with recognizing that action taken in towns and cities is essential for addressing global environmental problems. It accepts that, with an increasing proportion of the world’s population living in urban areas in low- and middle-income countries, these are important sites for engaging with the environment. The report finds that urban areas, by their very nature, provide a range of "sustainability multipliers" that can be tapped to address social and environmental burdens. These include lower costs per capita for providing services in densely populated areas, greater options for recycling, and better opportunities for the use of public transport. At the same time, city leaders can take a variety of proactive measures to help to improve resource efficiency and reduce negative environmental impacts.  Underpinning each of these strategies with strong political support and commitment. The report describes social and economic benefits that can be generated by addressing environmental challenges, and provides evidence to support engagement with these issues. It adds examination of practical mechanisms for funding urban environmental activities, noting that financial limitations have frequently impeded meaningful environmental activities in the past. "It is clear that the decisions and actions needed to move society towards more sustainable patterns of consumption and production will need to focus on, and be delivered in, cities," said UN Under-Secretary-General and UNEP Executive Director Achim Steiner. "Cities are well-placed to play a major role in decoupling economic development from resource use and environmental impacts, while finding a better balance between social, environmental and economic objectives," he added. Cape Coast fishing houses and town in Ghana: © SHUTTERSTOCK reprinted from the Report. "It is essential that national Governments create the space for cities to play a much larger role in transforming unsustainable patterns of human development," said William Cobbett, Director of Cities Alliance. "…local actions which directly engage and benefit communities can be truly transformative. However, cities need to integrate the environment into their planning before, and not after, urbanization." The report notes that negative environmental impacts from cities occur both directly, through the consumption of resources and the emission of greenhouse gases in cities themselves, and indirectly, through the use of raw materials and energy in distant locations to produce goods and services. “Some of the world's wealthiest and superficially cleanest cities may, therefore, concentrate the consumption of goods whose production may be elsewhere, but which entail both pollution and resource depletion,” says the report. The Cities Alliance's overall strategic objectives are to support cities in providing effective local government, an active citizenship, and an economy characterized by both public and private investment. The Cities Alliance seeks to realize this goal by: developing and/or enhancing national policy frameworks to address urban development needs; developing and implementing local inclusive strategies and plans; strengthening the capacity of cities to provide improved services to the urban poor; and developing mechanisms to engage citizens in city or urban governance. UNEP has been a member of the Cities Alliance, a global partnership for urban poverty reduction promoting and strengthening the role of cities in sustainable development, since 2003. Cities Alliance members include local authorities, national governments, non-governmental organizations and other multilateral organizations. The information in this article is from UNEP News of 9 April 2014. This article was published on the Horizon International Solutions Site on 20 April 2014. Two on Jonathan Rose Companies’ buildings: Residential Project Achieves High Standard for Green, Affordable Urban Development, featuring the Via Verde project in the South Bronx, and Downtown Redevelopment: The Denver Dry Building. Part One, Realizing Water, Sanitation and Hygiene for All focuses on the background of the problem, what it means for nearly half the people of the developing world who lack adequate sanitation and hygiene.